Edguy was born in the early nineties, and since have gone on to having sold more than two million discs. This now ‘Space Police’, is their tenth studio album. And once again this album will surely be a success. With the writing talents of Edguy’s leading man mister Tobia Sammett this is almost a must. Of course the crisp and clean production of Sascha Paeth is also always a good help in this. 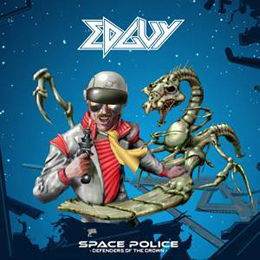 If you loved Edguy before, you’ll keep on loving them. Like other albums they’ve made, the musical side is very good. The vocals, well either you love them or you hate them, there’s no way in between I guess. And I’m on the loving side. And like on other albums, there’s also a silly side to it, but since that seems to be one of their trademarks. All songs are good, even the cover of Falco’s ‘Rock Me Amadeus’, but, I plead guilty your honour, I also liked the original version.